[Jakarta] I took this photo last week in Bukit Duri, Jakarta. This area is located along the Ciliwung riverbanks which also is my fieldwork area. It was the first time I went to this “kind of” community. I was hesitated whether it was approacheable in terms of the people and the area itself. Fortunately, I met two nice guys who then became my tourguides. It was a great experience to be there and witnessing the small-scale of flooding in this area. People are way more adaptive to flood than you’ve ever imagined. 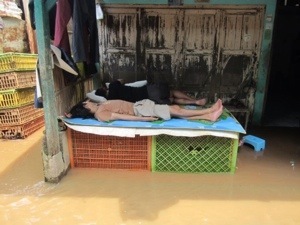 Children played Play Station on the flooded floor, girls and boys danced in the flood, people ate, took a nap, did their every day life’s activities, without complaining, without even bothered with the flood. In the end, it’s just the way we (want to) see a thing.